Nicole Kidman gets a bad rap. Despite the current backlash against her, she’s still a fine actress, and back in 1989 she found herself in her first big role in Dead Calm. 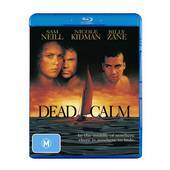 Based on a 1963 novel of the same name by Charles Williams, Dead Calm is an efficient and claustrophobic thriller that begins strongly but ultimately descends into slasher movie clichés. Husband and wife, John (Sam Neill) and Rae (Kidman) are taking some time out for R&R on their yacht. Drifting through the sheet ice seas they stumble across the athletic Hughie (Billy Zane), who claims his shipmates died of botulism. John doesn’t quite believe his story, and leaves his wife and the sleeping Hughie to investigate Hughie's abandoned vessel, the Orpheus. It quickly becomes obvious that their deaths – all attractive young women – may not have been accidental. A tense cat and mouse game between Kidman and Zane ensues as John struggles to keep the sinking Orpheus afloat. Kidman's Rae is apparently not the brightest fish in the sea, and takes some time to appreciate that Hughie does not want the best for his newly adopted hosts. Perhaps this is understandable since Hughie doesn't seem to know what he wants either: while he is clearly a psychopath, one wonders why he just doesn’t kill Rae immediately. This, and other logical flaws (Rae captures him, and then just ties him up on the floor? ), mar the second half, which increasingly resembles the final confrontation of any number of slasher movies, complete with the killer's almost supernatural ability to return from the dead. These contrivances detract from, but don't ruin, an otherwise taut thriller that benefits hugely from the small cast and the isolated location, beautifully captured by cinematographer Dean Semler. The performances from the three leads are fine, the energy between Zane and Kidman nicely contrasting the understated relationship between husband and wife. And it's this subtleness, sparse dialogue and Phillips Noyce's deliberate direction that gives the film its desperate, frightening tone. At least, that is, until Billy Zane turns into Michael Myers. The Blu-ray itself is mediocre, with no special features bar a very low quality full-screen reproduction of the theatrical trailer, and a transfer that lacks clarity and definition. Still, it's a perfectly adequate reproduction of the film, just don't expect featurettes on the level of the recent edition of J.J. Abrams' Star Trek.